I had a tire blowout on my 2010 XK so now I have a cracked Kalimnos wheel and need to get two new tires. My other three Kalimnos wheels could stand to be refurbished due to curb rash. I could get another Kalimnos either refurbished or off eBay and refurb the other three, but I’m also looking at a couple options for a complete set of F-type take offs with wheels and tires. The F-type rear wheels will poke out about 19-20mm more than XK wheels and the fronts are about the same. I’ve seen one thread where someone put F-Type wheels on their XK. Has anyone done this with 19” Centrifuge wheels and have photos? Any other photos of 19 or 20 inch F-Type wheels on an XK/XKR are welcome. Which 2 tires do you need, front or back? If your rear Kalminos wheels are fine, I would be willing to buy them from you. I have a 2010 XKR with Kalminos, and was looking for some to fool around with and widen. The damaged one is a rear wheel. Cracked in two places. i have a full set of 4 Kalimnos in Black with tyres. Came off my 2013 MY2014 XK-R as I fitted Vulcans. i don’t know if that would be of interest? Those Sumitomo's were a real bargain. LOL. Yes they were! Right up until last week.  I won’t be going anywhere near those for replacements. Did you hit a pothole in the recent past? I had a Conti Dws 06 split about a week after hitting a pothole. 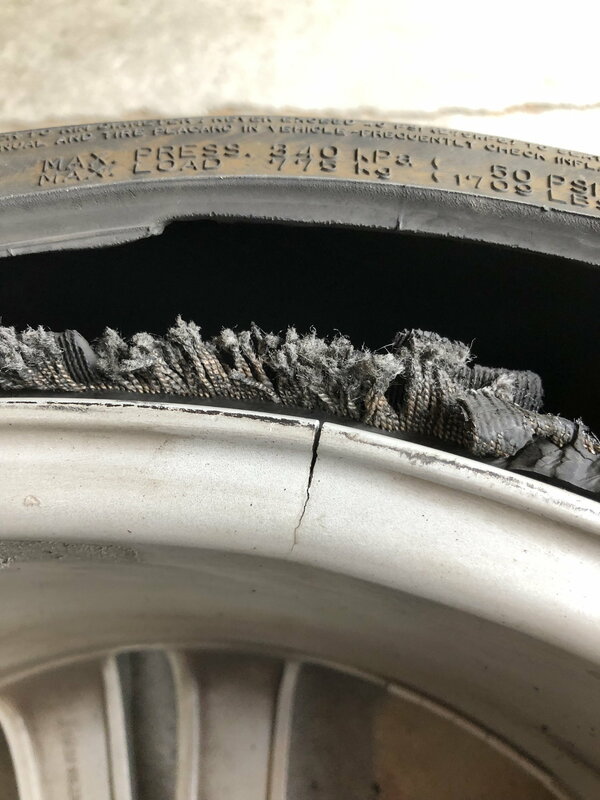 It was not a catastrophic failure... tire split open, but it still retained air. I was lucky enough to see the split before it failed when i was putting air in the tires. I also have the Kalimnos 20" wheels... wish I had 19"s.
The crack in the wheel indicates hitting something, rather than unexplained tire failure. I don't believe the tires are in any way to blame. My wife was driving the car at the time and she didn’t recall hitting a pothole, but it could have occurred earlier... or when she drove to a gas station on the flat :-O. The tires had 17k miles on them and the rears were ready to be replaced. We haven’t driven it hard so I would have expected a little more life out of them. AHHHH!!!!! Drove on a Flat. Yes, that would definitely split an alloy rim. ANYWAY.... in regards to the rear wheels fitting, even 19mm farther out is disconcerting... 20mm will probably reshape the wheel arch in an undesirable way, which is why those who use spacers on the rear (I don't like spacers, especially on the front. Rear is "ok" but not ideal) use 15mm. 20mm spacers on the front pose no clearance issues. I think.... Cambo??? posted something about the absolute largest 'spacer' dimension on the rear was 19mm, and that's iffy and tire-dependent. In my experience the F-Type wheels are not a good fit on the XK. While the fronts are the same the F-Type rear wheels will poke out 19mm further on an XK than the standard wheels, that's three quarters of an inch. Most people with taste would consider that "not good"
The way the pictures look it appears that the rim got cracked from a hard hit to a pot hole or something similar. 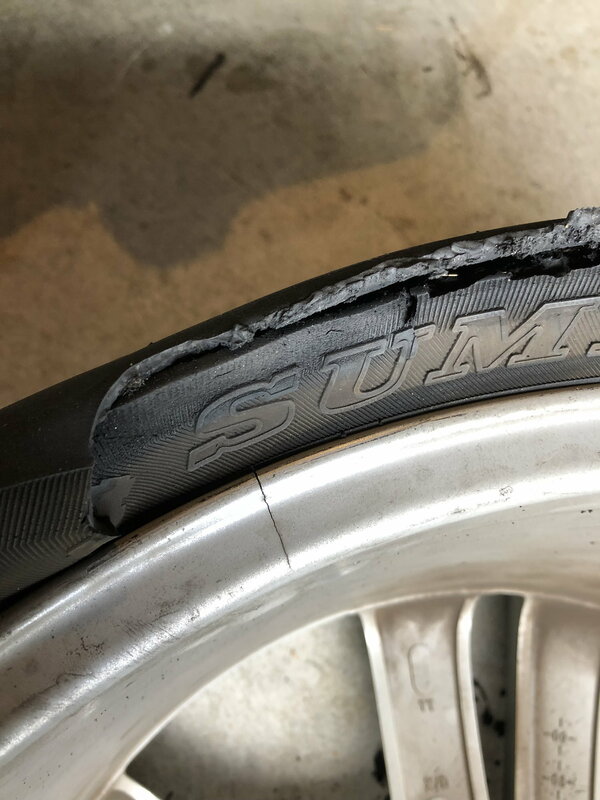 I am surprised that the TPMS didn't trigger before the tire was ruined. The tire shred after driving on it. My kid had a similar problem because he didn't stop when the TPMS light came on. I am surprised that the TPMS didn't trigger before the tire was ruined. I’ve had the TPMS gremlin for some time where the warnings come on almost all the time despite pressure being normal. It’s so unreliable that we ignore the warnings and I just periodically check pressures manually. I’ve tried the recommendations to alter inflation pressures to get them to reset but it’s never worked. I have new TPMS sensors to install with this wheel/tire change to see if that fixes it. We don't hear that much do we? Hey at least she's OK, but in 37yrs of driving I've never managed to damage a rear wheel, reminds me of when my (now ex) wife reversed into a wall which collapsed on her car causing £2k of damage, she couldn't remember how it happened but blamed the construction of the wall!! The good thing is yours, like mine will be paying for the damage out of her own pocket, won't she? I’ll blame the Sumitomos or the faulty TPMS or the California roads before I’ll blame my wife. Did she tell you to post that?? Cause you've got a collection of rims in the sitting room? Dealer painting 19in Centrifuge wheels? Quick Reply: F-Type Centrifuge Wheels on a 2010+ XK/XKR?